None of us can remember when we were babies. Think about that. How did you learn to talk when you were a toddler? Toddlers learn to talk – communicate – by LISTENING to those around them TALK and equating those sounds to objects, feelings, smells, and ????. There’s no piece of paper. You can be blind and learn to talk. Remember my Roger story in Part One? Back in the 1960’s, the Boy Scout way of learning Morse code was WRONG. You LOOKED at a piece of paper that had the alphabet on it and next to each letter were dots (di’s) and dashes (dah’s). The paper caused your brain to add an extra step in the learning process that slowed you down and caused confusion in many cases. Forget about the Boy Scout method. You’re going to learn Morse code the way toddlers learn to TALK. You’re going to just HEAR the distinct letters in Morse code and your brain is going to equate them with LETTERS, NUMBERS and PUNCTUATION marks. I AM HUNGRY WHEN DO WE EAT DINNER? So your brain was able to understand that pretty easily if the person reading it did it slow enough and created the pauses between the words. The question mark doesn’t come out when you speak each letter, because in normal speech we inflect our voice to create that. The word WHEN is also a clue it’s a question. That’s what a person sends in Morse code if they want to start a conversation with someone else. I learned Morse code by doing the Koch Method. It’s all auditory. This means you hear the sound and map it in your brain. It’s recommended you learn the Koch Method at a speed you intend to operate. Shoot for 10 words a minute. I had all sorts of frustration trying it higher than that. You may be a better auditory learner than me. Whatever you do, DON’T put pressure on yourself. I’m guessing you’re doing Morse code for fun and pleasure. If so, there are many many CW operators out there like you that WILL SLOW DOWN for you to have a QSO. You don’t have to be a speed demon to do CW. In fact, the pros will tell you that accuracy of sending code is far more important than speed. If an operator goes too fast, they’ll bunch all the words or letters together and you’ll be confused trying to listen. Remember that fast-talker guy for the first FedEx TV commercials years ago? The Koch Method employs a series of forty lessons starting first with the letters K and M. This training tool can be downloaded into a computer or onto a smart phone as an app. I purchased the Koch Trainer App by Pignology for my smart phone because I’m a Mac guy and the software for computers is for PCs. There’s another app called the Morse Trainer and there’s one called Koch Morse Trainer Pro. These are not hard to use. Fire it up and just march through the lessons. Once you master the letters K and M, you then advance to lesson two. The software adds a new letter. You keep doing this until you get through all the letters of the alphabet, the numbers 1 through 0 and then some important punctuation marks. Are you ready to jump in? What’s the first thing you need to do to become proficient at Morse code? Well, the first thing is attitude. We discussed that in Part One. You must have the right attitude. You must develop the passion to learn. Did you see the movie Patton with George C. Scott? It came out in 1971. My dad loved that movie. He was a medic in WW II serving in General Bradley’s army alongside Patton’s men. There’s a part of the opening speech in the Patton movie that fits right about now. It’s a little graphic, but it answers the question you may have about not knowing what to do when it comes to learning Morse code and making your first QSO. As an adult you’re ego gets in the way. You don’t want to look bad in front of others. Small children don’t have egos. That’s why they jump into new things. As an adult you erase fear and minimize ego barriers by knowing what to do when. The reason the young soldiers General Patton was talking to were nervous is because they had yet to experience what they were up against. You feel that same fear about your first QSO. I know – I did too! I recommend you listen to the entire speech, as it will help you hone your attitude about learning Morse code. But the part I want you to listen to starts at 2:43 into the video below. I’ll apologize in advance, as the language and descriptions in the video are graphic. When George C. Scott says, ” … you’ll know what to do.”, you can stop the video. What does this have to do with Morse code? You making your first QSO? If you STOP NOW and LEARN the letters, numbers and some of the punctuation, THEN you’ll KNOW WHAT TO DO. I know this seems very basic, but a few people just want to jump in and get going. They want to get on the air. If this is you, slow down. Let’s go to Part Three now. I’m going to show you how to learn the entire alphabet in just two weeks. It was bound to happen. My zepp dipole antenna is oriented so it sends a strong signal to the northeast. Northeast of me is 2500 miles of Atlantic Ocean. This afternoon I sent CQ CQ CQ DE W3ATB W3ATB and who came back? This is Alasdair’s address from QRZ.com. 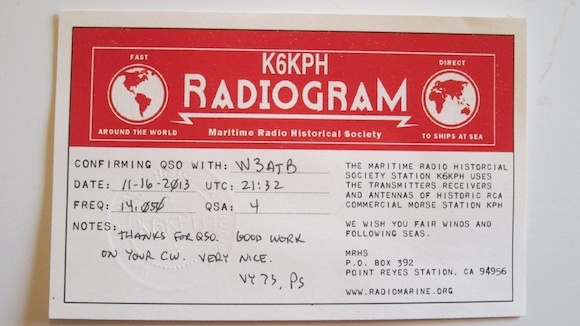 It’s a great resource allowing me to send him a QSL card. He lives in Shrewsbury, Shropshire UK. Look closely at his address. Tell me that’s not super cool! No street address – just “The Stiperstones”. What’s that? Wouldn’t you love to know? 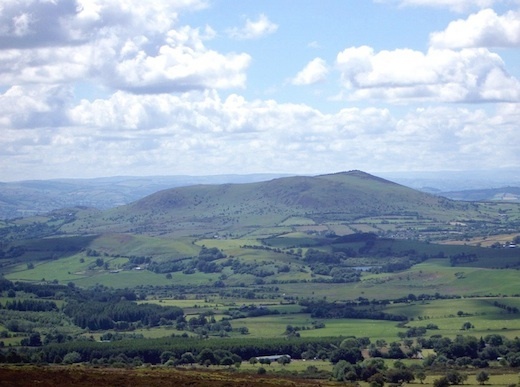 Well, the Stiperstones is a craggy jagged hill that’s quite famous in western England. At first when I saw Alasdair’s address, I thought it might be some large estate by that name. 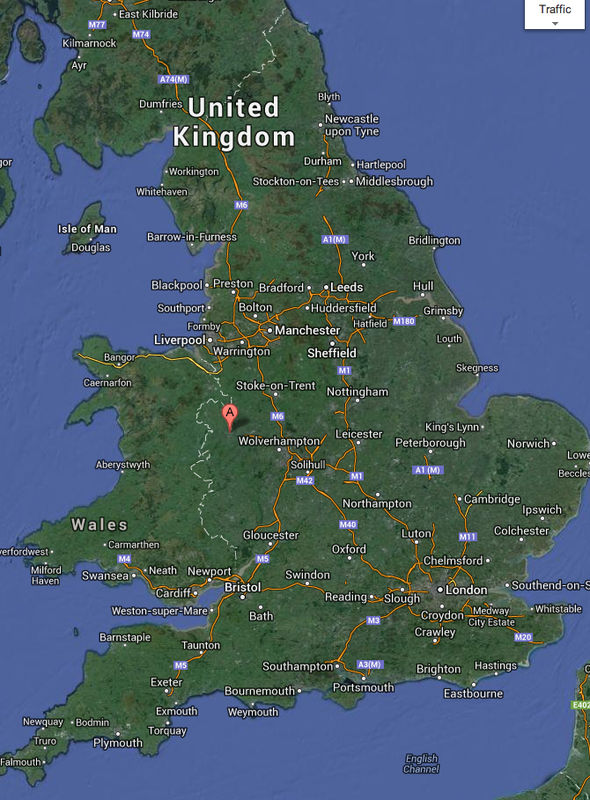 Shrewsbury is about 150 miles northwest of London and about 15 miles east of Wales. He lives in the countryside and it’s beautiful. This is what it looks like just above Alasdair’s house. Wow! Alasdair told me the weather there today was cool and dry. I was having some trouble hearing him because another station was stepping on his signal. That happens by accident because another operator may not hear Alasdair or me doing our conversation. Suffice it to say I was pretty excited! The red balloon is where his town is located. Thanks Alasdair for answering my call. You were infinitely patient with me. The red balloon is X marks the spot! My Morse code mentor and good friend Jim Cluett, W1PID, was pointing to crescent-shaped growths on the outside of a 12-inch diameter birch tree. He and I had just spent a few minutes admiring the tall waterfalls on my 90 acres of woods in central New Hampshire. 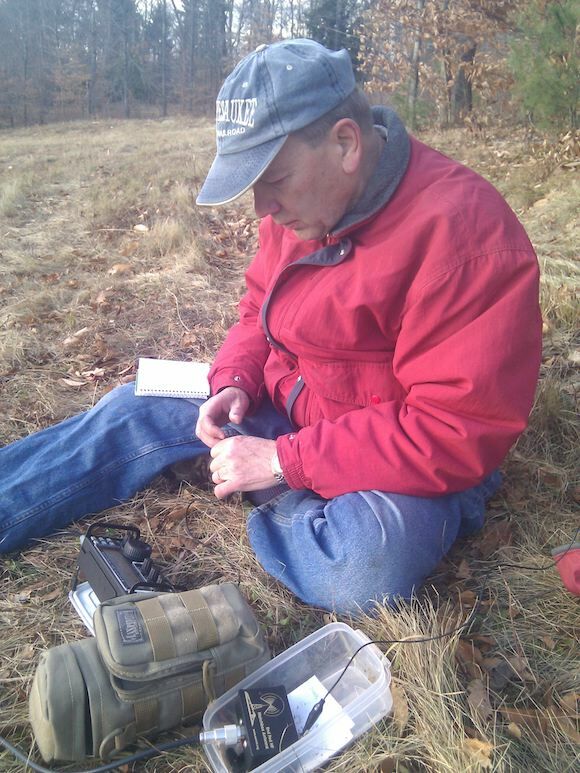 We were taking a hike and planning to operate his fancy Elecraft KX3 portable transceiver. This rig is magic in a box. “I have no clue. I’ve never heard of that stuff,” I replied while adjusting my bright red and blue knit hat. I was a walking beacon in the woods wearing my lime-green Milwaukee heated jacket and soft knitted hat. It was hunting season in New Hampshire and I didn’t want to be mistaken for a burly brown buck. While my heated jacket was equipped with a 12-volt lithium-ion battery, I soon discovered walking was all I needed to keep warm. Minutes into the hike I had opened my jacket to stay comfortable. Spending an afternoon with Jim I was discovering was not much different than what Bilbo Baggins must have experienced as he and Gandalf walked together towards the Misty Mountains. Jim even looked the part of Gandalf with his beaver-chiseled walking stick given to him by his daughter. She had plucked it from a beaver dam a few years before and thought it would be a grand gift for her dad. Based on the silky smooth surface of the upper part of the shaft I was certain it was a cherished heirloom. The branch was polished by Jim’s hand having walked countless miles with it. “A fire piston is a clever device you use in the wild to make a fire. It works like a diesel engine using compression to create high temperatures that ignite a small piece of the fungus. You then take that little ember and use it to start a fire,” expounded Jim. What else was I going to discover this late fall day? It was mostly sunny, but brisk. A weather system was bearing down on us from central Canada promising to usher in the first measurable snow of the season and quite cold temperatures. The forecast low for the upcoming night was 18 F. Mother Nature didn’t disappoint as I discovered the next day. Jim and I were trying to take advantage of one of the final great hiking days of the season. I was the leader and Jim said it was my adventure. He was following me wherever I wanted to go. 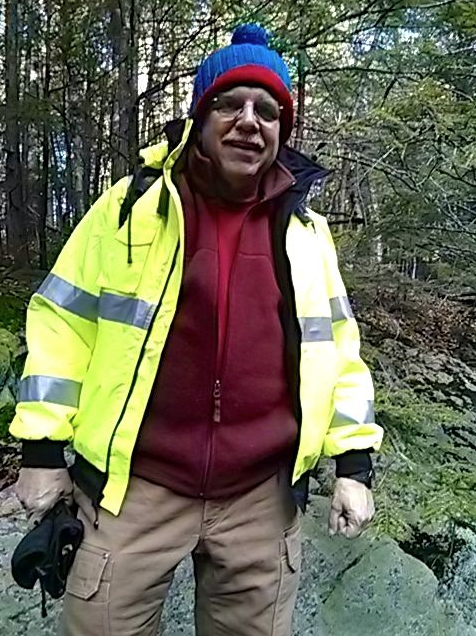 My thought was to take him to see two of the three major cascades along Blake Brook and then head up to higher ground to operate CW on his tiny multi-band radio. I had been waiting for this day for months. Jim routinely hikes outdoors taking his small radio with him. 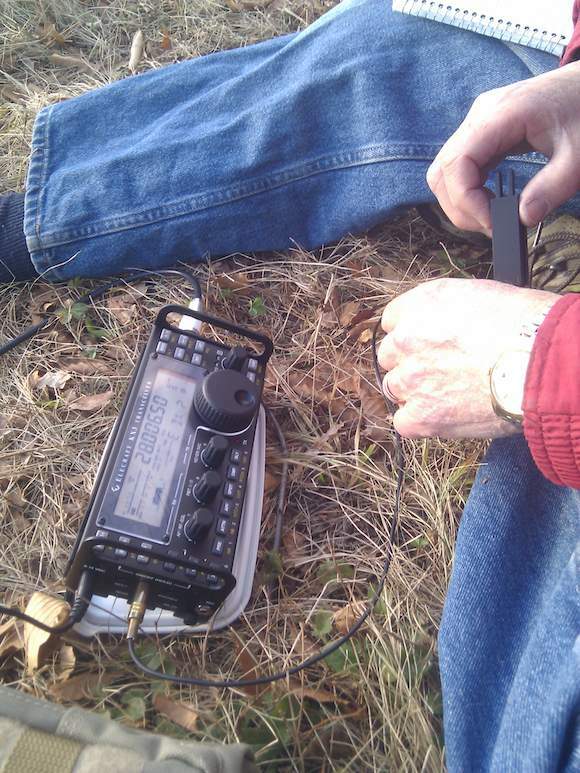 Just as the radio is multi-band stretching from 160-6 meters, Jim operates CW in the field for both enjoyment and to hone his skills if there’s an emergency. Each time he slings his water bottle 40 feet in the air to snag a branch for his thin wire antenna, he’s multi-tasking. He wants to be able to operate in the field no matter what the weather conditions might be. It’s what you’d expect from a pro. After viewing a second waterfalls and round pothole drilled into the bedrock by swirling waters and gravel at the base of the falls, it was time to head back towards the warm sunny field where we’d set up his rig to see who was on the air. “You know one of the things I love about operating in the field?” Jim exclaimed as we we hiked up away from the falls and through the forest. 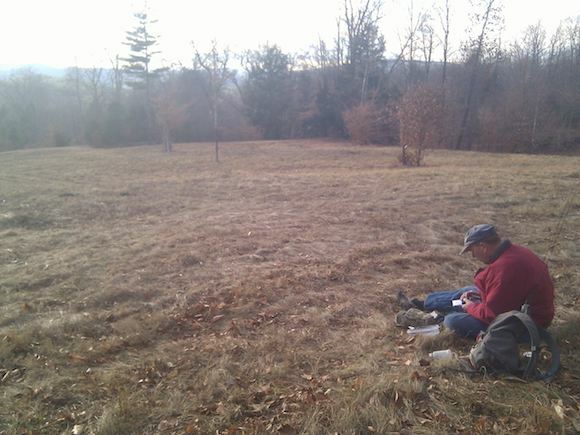 About thirty minutes later Jim and I saw the freshly cut brown grass laying flat in the large field as we cut sideways across the sloping leaf covered forest floor. Our footfalls crushed the dry leaves making a wonderful crunching noise. The open south-facing field would make a perfect place to capture some of the invisible radio waves that were bouncing all around us. We weren’t going to be denied. Fortunately it was mostly sunny with puffy white clouds racing across the sky in advance of the cold front. Jim took off his compact backpack. Inside was everything he needed to communicate with people all over the globe. The radio and battery fit inside a small tubular canvas carrying case and all the other things he required were inside a translucent plastic case you’d store leftover food. It only took a few minutes of setup to be on the air. Within 15 minutes Jim had gathered four contacts on 10, 15 and 20 meters. There was a world-wide CQ contest running clogging many of the bands, so QSOs were fast sharing just the most basic information. For the past nine months I’ve been in awe of Jim’s CW skills. He’s been doing CW for over 50 years so you’d expect him to be have great skills and magic when using this method of communication. As he operated, I would lean in to look at the amazing Elecraft portable radio. I’d seen photos of it in many of the stories he’d written about his outdoor radio adventures, but had never seen it in operation. “These handles on the side I bought from another guy. When you put on the clear plastic cover, they work well to protect the radio knobs from damage as you transport the rig.” Jim was right. As the sun sank in the sky, it went behind a giant evergreen tree placing us in a shadow. It didn’t take long at all before we started to get cold. Jim was trying to make his last contact and I was looking at the large LCD screen that showed all sorts of data. I could see the SWR meter moving about but something else caught my eye in the lower right corner. Why were those letters moving across the screen? Wait a minute, didn’t I see PID there and something else scrolling from right to left much like you see the newsfeed crawl when watching cable TV news or the weather? “Hey, this radio is translating the Morse code for you!” My eyes were bigger than silver dollars. No, Jim I don’t. But we’ll never know, will we? Too bad you can’t see the grin on my face as I type this. “Talk to me.” Using the caller ID on his phone, my mentor Jim Cluett, W1PID, knew it was me calling. The Maritime Radio Historical Society has a rich heritage. I was just ten days into my CW (Morse code) journey whereas Jim has been doing it for over fifty years. This conversation with K6KPH was only my thirteenth CW QSO – that’s the q-sign acronym ham operators use to define a conversation between two radio operators. When I first copied the call sign of the radio operator, K6KPH meant nothing to me. I went to QRZ.com to look up who he was. I thought I had made contact with some operator in Wisconsin or maybe Michigan. Or, it could have been someone in Pennsylvania or New York. That’s who I’ve been snagging in my net for the past ten days. Here’s what I saw when I went to qrz.com. WOW! When I saw the name under the call sign at QRZ.com, I about jumped out of my chair! I couldn’t push the redial button fast enough on my phone to tell Jim. He’s asked me to either email him or call him on the phone each time I make a contact using Morse code. Jim is trying to teach me as fast as possible much of what he knows about this glorious method of communication. CW is pure, it’s universal and it’s fun. Many people roll their eyes about Morse code, but believe me, it’s alive and vibrant. “It’s like drinking from a fire hose,” Jim will commonly say. There’s just so much to learn. The past ten days I’ve had my ups and downs because I can’t copy the code – that means translate it as I hear it – as fast as I would like to. I get frustrated as you might imagine. But this afternoon, the experienced operator picked out my CQ CQ CQ signal from 3,000 miles away and decided to answer me back. How cool was that? I’m sure many other stations were trying to do a QSO with him, and they were much more experienced. Working K6KPH bolstered my confidence. It was one of the high spots for sure of the past ten days. I’ll be sending them a QSL card on Monday for sure! Here’s the QSL card I received from them in February, 2014. This is the official QSL card from K6KPH confirming my QSO. It was very exciting to see it in the mail! My first introduction to Morse code was in the early 1960’s. I was a lad of perhaps 10 years old. I have a dim memory of being in a car with my childhood friend Roger Boncutter. He suggested we get our ham radio licenses. 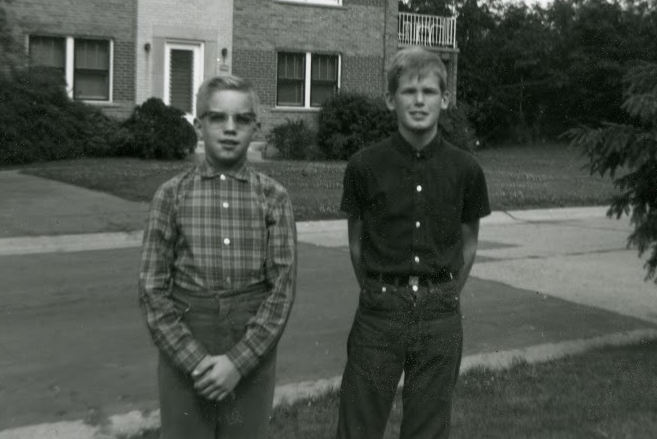 That geek on the left is me. Roger is on the right. We’re standing in my front yard in a middle class neighborhood in Cincinnati, OH. “We’ll have to learn Morse code,” Roger said. Roger was two years older than I was and I looked up to him and trusted him. He showed me a page of the dots and dashes (we now call them di’s and dah’s as that’s how they sound) next to the letters of the alphabet. I tried to memorize them, but gave up. Suffice it to say I’d have to wait just about forty years to get my ham radio license. Fast forward a few years and in September, 1966 I was sitting in a desk at Roger Bacon High School in Fr. Warren’s classroom. I had my Latin book in front of me and my eyes were glazed over. Not only was Latin a foreign language, but it was a dead one at that! I didn’t do well in Latin. In fact, I failed it my freshman and sophomore years. Yes, I had to go to summer school to advance in high school. I sucked at learning a foreign language. I was stubborn in high school and more like a wild stallion than a mature young adolescent. Plus, I wasn’t mature enough to recognize the benefit of learning Latin – and how discovering its vocabulary would help me years later as a professional writer. After doing custom remodeling and building custom homes for two decades, I started AsktheBuilder.com. Yes, it’s really worth it to pay attention in school. Such is life for young men who don’t listen to their parents and teachers. Morse code is just that. It’s a foreign language. It’s not a tough language to learn, as you only have to memorize about 50 combinations of letters and numbers to get started. As you advance and begin to master Morse code, you’ll soon discover there’s probably closer to 75-100 combinations as Morse code uses things called prosigns and Q-signs (they’re also called Q signals and Q codes) where two or three letters are jammed together to create an abbreviation for a phrase. Modern texting on cell phones has nothing over Morse code, affectionately known as CW by those of us who produce the invisible truncated tones over the airwaves. CW is the acronym for continuous wave. Think of a steady tone in your head. Go ahead, start to hum. I know it’s corny, but do it. Do it out loud. Now, interrupt that tone into sounds of different length. That’s Morse code. You’ll see kids and adults today text: “r u sick” or “roflmao”. CW operators had been doing this for decades long before cell or smart phones were even a gleam in the eye of the inventors of the tiny radios. Yes, cell phones are radios. You knew that, right? Most people don’t make that connection. They just think cell phones are magic. Nine months ago is when the CW bug bit and wouldn’t let go. I was in a small room filled with young Boy Scouts watching two Morse code pros do a demonstration. The radio they used, as well as the magic of passing a message about zombies, set the hook deep. I started to work on learning and using the code, but all sorts of things got in the way. I wasn’t focused. Read that again. No, seriously. Read that sentence again. If you want to learn Morse code, or how to solder a pipe. or how to tape and finish drywall like a pro, you must be focused. You must be passionate about what you’re trying to do. Think about that for a moment. Think of the things you’re really good at. How did that happen? How many hours a week did you practice at doing that thing? Yes, it’s all about practice. Where do you think that old adage “Practice makes perfect.” came from? People around you who don’t care about Morse code will find the di’s and dah’s annoying. At first they may humor you, but after a while that grin on their face will turn to a frown. You have two choices: You can get earphones or a headset, or you can relocate yourself so you don’t bother people in your family. 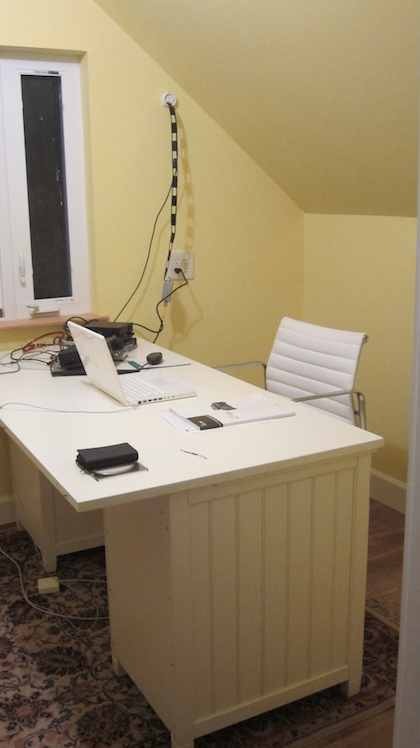 Moving to a remote, soundproof location where you still might use ear or headphones can create a great environment to learn. The open nature of my home was not a great place to do Morse code. It bothered my wife. I needed to get as far away from the living area of the house as possible. Plus, near my basement office, I didn’t have an ideal location to erect a great antenna. I needed a real ham radio shack. The attic of my garage was the perfect place. There, in that dark cavern, I could carve out 85 square feet of space, install a window in the gable end for some natural light, build a partition wall to allow heat to stay in the space and build and erect outdoors in the adjacent tall trees a multi-band zepp center-fed dipole 80-6 meter antenna. All of this work was completed and move-in day to the shack happened on November 3, 2013. Here’s a photo of part of my shack. It’s hard to show the entire room, even with a wide-angle lens. We’ll pick up the rest of my Morse code journey in Part Two.